Blech! We are smack dab in the middle of the “mid-winter blahs” in our house. Maybe you’re experiencing it, too: the utter lack of motivation to do absolutely anything. Normally we are a pretty productive and active family…but not so right now. Between the snow and the gray-colored days and the getting up in the morning while it’s still dark (oh, and the sun setting well before the supper hour! ), my get up and go….well, it’s gone somewhere I can’t find it and I am left wondering if it will ever return. I am so tired in the mornings, I need my carafe…er..mug of coffee just to get going. And popping vitamin D like it’s candy doesn’t seem to be helping me even a tiny bit! So, how do we stay motivated? Well, I find for myself that this is a great time of year to introduce some incentives (especially for my music students). As an adult, I enjoy a little incentive every now and then–the promise of a London Fog from Second Cup can get me through almost anything and even my dear friends will entice me to workout with them with the promise of coffee and good conversation after the physical torture–so it stands to reason that our children just might like that, too! We are definitely the house of experimental incentives. Some work brilliantly, some not so well. For this month, we have told our children to put a sticker on the calendar for each day they practice. If they each have 25 stickers on the calendar by the end of the month, we will do a special activity as a family. What will that activity be? I have no idea!! But considering it’s almost the end of January, we should probably figure that out! Most likely we will go together as a family and see Gulliver’s Travels at the “cheap theater”….but we could also do a skating outing or swimming….as long as it’s a family activity we all enjoy, it will be a hit! (Actually, not revealing the reward ahead of time has made it much more exciting for them.) We try as much as possible to make the rewards time spent together…rather than monetary. But I have to confess, we have done a monetary reward (we are human after all). During the summer we spend a good part of July camping in the Okanagen. It’s safe to say that no practicing gets done during this time. So, when we got back in August this year we thought a little incentive might be in order to get back into the swing of things. My hubby taped a twenty-dollar bill to the bathroom mirror and told our kids that if they did double piano practice every day for the month of August with no nagging from us and no whining from them, they would each get 20 bucks at the end of the month. If they forgot and missed a day or two, they had the option to restart from that day for another 30 days. Did it work? It sure did…well…kind of. After a couple of days, Dexter thought the best way to do double piano practice, would be to practice double the speed…not exactly a quality practice. When I reminded him he needed to slow down and do a careful practice he said, “But, Mum, then it will take me twice as long!” Um, yes, that’s kind of the idea. Well, they stuck it out and at the end of the month they each earned their 20 bucks, but when we offered them the same deal for September they simultaneously said, “No thanks!” So, I guess we learned that paying kids to practice is maybe not the ideal way to go. Yes, it accomplished what we needed it to: to get back into the routine of practice and keep up those valuable skills over the summer, so I wouldn’t call it a failure. But, it didn’t teach them to practice just for the enjoyment of playing the piano. Although, I guess when it really comes down to it, that’s kind of the nature of incentives they are a temporary fix. That’s not to say they don’t have value, but it’s good to be creative with them and use them only occasionally. And be prepared that there are some times when they won’t work at all. There have been occasions when I have offered incentives to my youngest to no avail. So then, I must confess, I have resorted to trickery. A couple of months ago, no mount of cajoling (um,I mean encouragement) or bribery would get Dexter up to the piano to do his practice, so I sat down and started playing the right hand of one of his pieces. I tried to make it sound like so much fun and asked to come play a duet with me. He suspiciously came over and slid onto the bench, then finally he tried the left hand. We giggled a bit over our duet and tried it again, then we traded places, dancing around the piano bench as we switched places. It was fun….we tried it with his other pieces and even his scales and before we knew it we’d played everything a few times each. Suddenly he looked at me and said, “You tricked me!! We just did my piano practice!” With wide-eyed innocence I replied, “What? How did that happen?” Yes, he’s onto me but I’ll never admit it! Through it all, I think the best thing we can do to motivate is just to be there and cheer them on. Let them know how important it is to you and how proud you are of them. My husband is always telling the kids how he wishes he could play the piano and is always asking for impromptu recitals at home. If you are a single parent, recruit a favorite aunt or grandparents to do this for you. Take them to the Kids’ Symphony or other musical performances to inspire them. My daughter and I just recently had tea at Rutherford House and she was allowed to play on Mrs. Rutherford’s piano from 1880….in fact she was asked to by one of the staff members as it helps to keep the piano in tune. Then after she played for a while, the staff peeked in the door and said they could hardly believe that was her playing and that they should hire her. What a great boost to her self-esteem and inspiration to keep plugging (or plunking) away, and it made me think: maybe this would be a good reward incentive….reward a great month of practicing with a special family tea at Rutherford House and a little mini performance in the parlor! The possibilities are endless…. So I do confess I use it all to try to keep this household inspired: incentives, trickery, encouragement. It’s all trial and error at times after all I am only human and I certainly don’t claim to be a motivational expert. Although, I guess, if you are a friend, parent, sibling or teacher then maybe that title just goes with the job description. You should be a teacher! “You should be a teacher.” I first heard these words almost 20 years ago as a grade 12 high school student. They came from my piano teacher, Monte Anderson, well actually they came from THE best piano teacher in the world! Because I admired him so much and because he was so enthusiastic about it, I patiently sat through the little extra sessions he would tag onto my lesson teaching me about piano pedagogy. It may have helped that I also knew teaching piano, as a side-job, might bring in a little more cash per hour than working fast food. But, other than that, I had no intention of ever being a teacher. I was going to be a concert pianist and travel the world! Graduation came and went and it was time to figure out what I should study at university. My parents drove me out to the West Coast for a tour of the university I was interested in and we met with an admissions counselor. After the tour and an interview with her, she said, “You should be a teacher!” and went on to explain how it would be the perfect career for me, that I could still make music my major but that an education degree would open more doors for me. I nodded and listened politely–and then enrolled in a Bachelor of Arts degree with a major in Music because I was NOT going to be a teacher–I was going to be a concert pianist and travel the world! I fell into a blur of classes (taking an arts degree at a liberal arts university sure involved a lot of classes that weren’t related to becoming a concert pianist! ): science, math, english, philosophy, psychology, music education, pedagogy, music history, choir, voice lessons, piano lessons, more piano lessons, and hours a day in the practice rooms. During these piano lessons, I finished up my grade 10 Royal Conservatory and was working on my ARCT (of course I was going to do the performance option!) when my university piano teacher, Sandra Friesen, said, “You really should be a teacher. You would be amazing at it.” And she asked me to consider doing the Teacher’s ARCT rather than the Performer’s. I barely managed to refrain from rolling my eyes in exasperation and, instead, politely told her that I just was not interested in being a teacher, I was going to be a concert pianist and travel the world! And, for a summer, I kind of was and I kind of did. I auditioned for the Continental Orchestra and spent an “adventurous” three months in 1996 traveling all across the USA from California to New York and back again, even flying over to Israel for several performances. It wasn’t quite as glamorous as I thought. When I wasn’t rehearsing or performing, I was traveling by airplane or (more often) a stuffy bus at all hours of the day and night trying to grab sleep here and there, hauling equipment around and watching each city go by in a blur, sometimes forgetting where I even was! But I was still okay with that. I could do it! Then April 1997 arrived, I finished my 4th year of university, got that little piece of paper that said I was now Michelle Walker, BA, married the most amazing, supportive guy and moved to…Edmonton?? ?…and life just happened. I found out there aren’t many openings for concert pianists and practicing for hours a day doesn’t pay bills, so I took a job working as a bank teller. It wasn’t very glamorous, it wasn’t all that exciting…..and it took up a lot of time, so my hours of practicing each day decreased…significantly! I wasn’t very content with my lot as a bank teller, it was at times stressful and emotionally exhausting, so after almost a year I started looking for other work. At an interview I met another pianist with an arts degree and we spent a great hour chatting about music and life. At the end of our chat, she said, “You would make a great teacher!” and she went on to tell me that Alberta College offered a music in early childhood program and they were looking for more teachers to teach the program. She generously gave me the name of the director of the program, told me where to submit my resume and even what to put on the cover letter! September arrived and so did the first day of classes. Butterflies and second thoughts swirled at dizzying speeds, how had I ever thought I could do this? What have I done? But I pulled myself together and left for work. Turns out…that first day was incredible! The children and I took to each other immediately, it was SO fun!! I came home on a high, I felt like I could go out and go dancing all night…never in the last year or so had my work left me feeling so energized and alive. This was exactly what I was supposed to do. I realized: I really should be a teacher! And so I am! 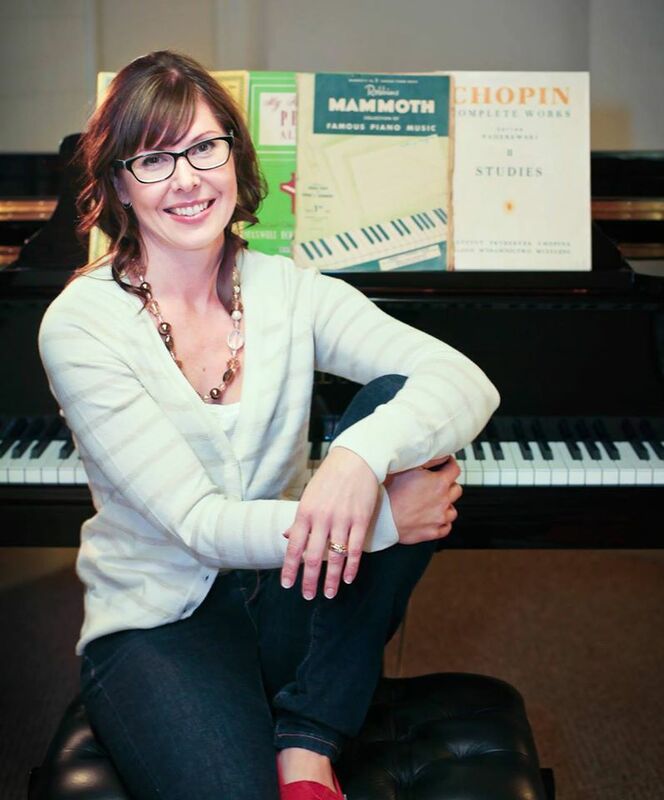 I taught that program at Alberta College until 2005 and then left to focus on the growing number of private piano students that I was teaching in the lovely home studio that my amazing, supportive hubby had helped me set up. One warm, spring day in 2007, a very dear friend called me in excitement. She had just registered her children in a Music for Young Children class, and said, “You have to check this program out because YOU should be an MYC teacher!” This time, I listened.